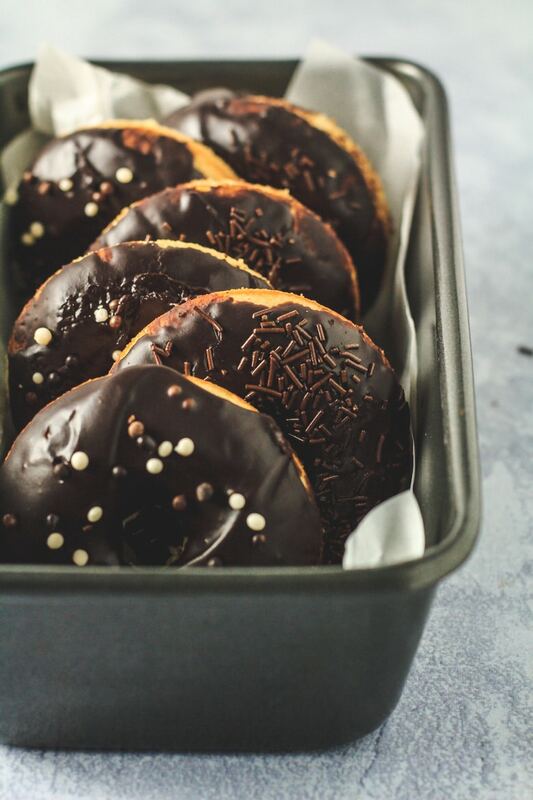 Baked Vanilla Doughnuts – Deliciously moist and fluffy doughnuts that are BAKED, not fried, infused with vanilla, and topped with a thick chocolate glaze! I absolutely LOVE doughnuts – baked or fried. But you just can’t beat making doughnuts that are baked, because they are much less messier to make, and dare I say a little healthier? 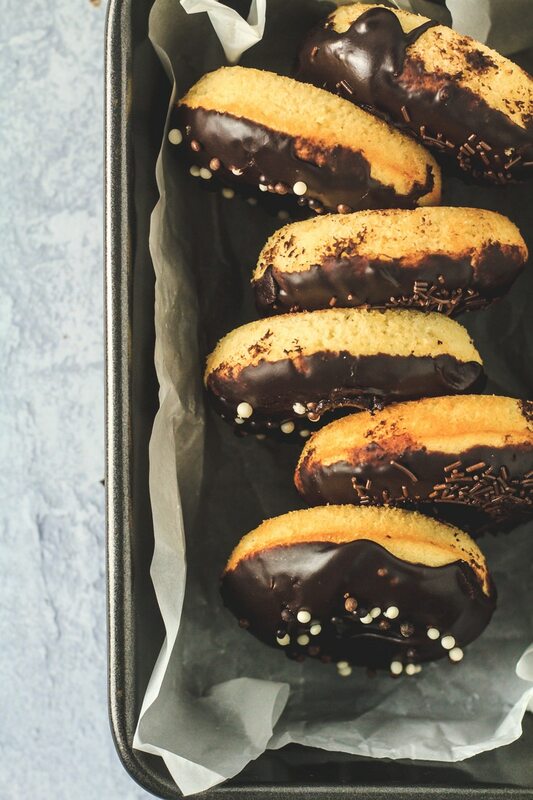 These Baked Vanilla Doughnuts are moist and fluffy, perfectly infused with vanilla, and dunked in a thick chocolate glaze. 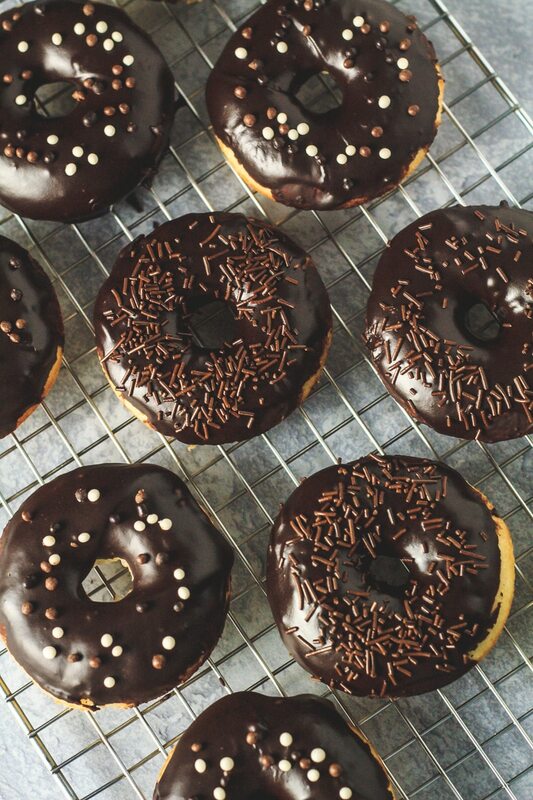 Top with your favourite sprinkles, and you have yourself the perfect baked doughnuts for any occasion! Looking for more scrumptious baked doughnuts? See my Baked Lemon Raspberry Doughnuts, Baked Double Chocolate Orange Doughnuts, and my Baked Lemon Blueberry Doughnuts. Buttermilk: See my recipe notes below on how to make your own. To make these doughnuts, simply start by whisking together the flour, baking powder, and salt. Set aside. In a separate bowl, whisk together the egg and sugar until combined. Add the buttermilk, oil, and vanilla, and whisk until combined. Graually add the dry ingredients, and fold in until just combined. Do not overmix. Spoon or pipe the mixture into a well-greased doughnut pan, filling almost to the top. Bake for 10 – 12 minutes or until a toothpick inserted comes out clean. Allow to cool for 5 – 10 minutes before transferring them to a wire rack to cool completely. For the chocolate glaze, whisk together the icing sugar, cocoa powder, vanilla, and milk until smooth and combined. Add more milk if you’d like a thinner glaze. Dip each doughnut into the glaze, and leave to set on the wire rack. How long will these doughnuts last? These doughnuts can be kept in an airtight container at room temperature or in the fridge for up to 2 days. Can I freeze these baked doughnuts? Yes, glazed and unglazed doughnuts will also freeze well for up to 2 months. Thaw overnight in the fridge before serving. Preheat the oven to 200C/400F/Gas 6. Grease a doughnut pan, and set aside. Whisk together the egg and sugar until combined. Add the buttermilk, oil, and vanilla, and whisk until combined. Add the dry ingredients, and mix until just combined. Do not overmix. Spoon the batter into the prepared doughnut pan, filling almost to the top. Bake for 10 - 12 minutes or until a toothpick inserted comes out clean. Allow to cool for 5 - 10 minutes before transferring them to a wire rack to cool completely. Whisk together the icing sugar, cocoa powder, vanilla, and milk until smooth and combined. *To make your own buttermilk, simply add 1/2 tablespoon of fresh lemon juice or white vinegar to 1/2 cup (120ml) of milk. Stir to combine, and allow to sit for 5 - 10 minutes until slightly thickened and curdled. 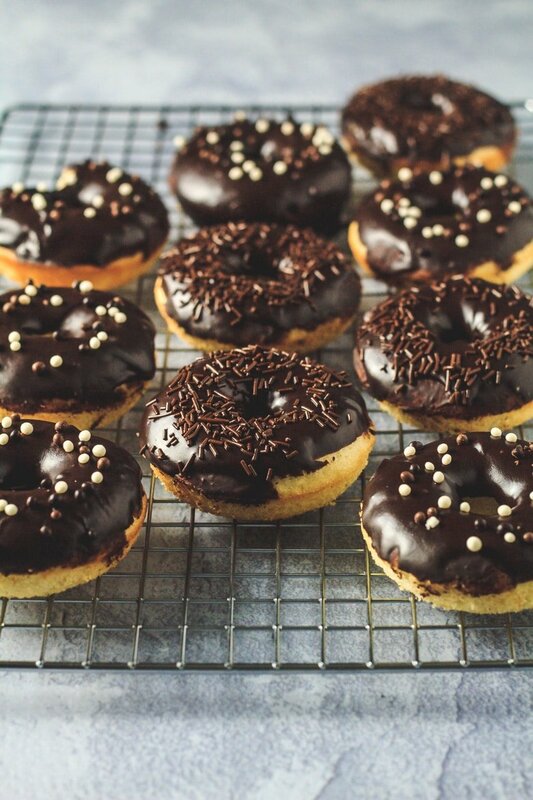 Perfect donuts. My daughter loved them! 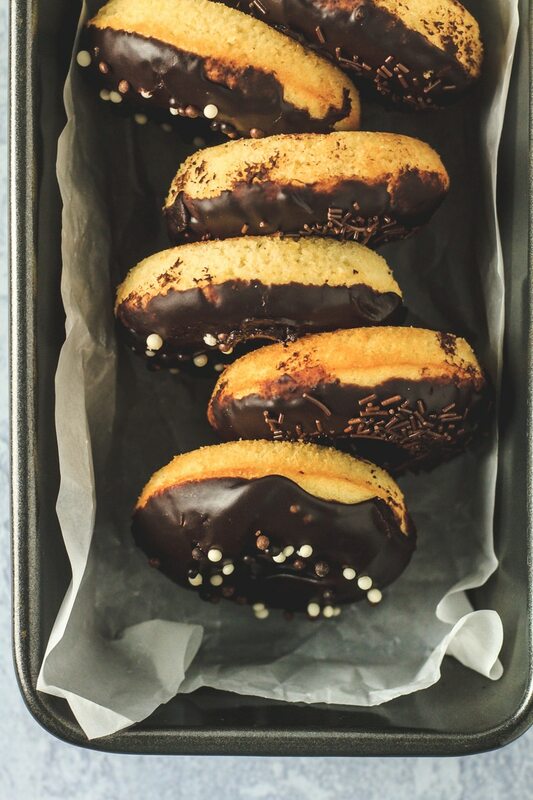 I’ve made some of your other doughnut recipes and these look like they’ll be just as fabulous!!! 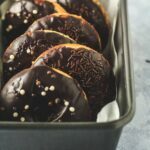 Is there any way to make this recipe without a donut pan? They look so yummy! Do you have a recipe for raised glazed donuts? When you say you can keep the leftovers in the fridge and even freeze them, are you talking about the donuts WITH the glaze or without? No, I was actually hoping to learn that I could freeze them WITH the glaze. Where do you get a donut pan?